The Joan Mitchell Foundation recently announced the 2018 recipients of its Painters and Sculptors grants, and this year’s list includes none other than Jose Villalobos of San Antonio, the lone Texas artist to receive $25,000 in unrestricted funds. 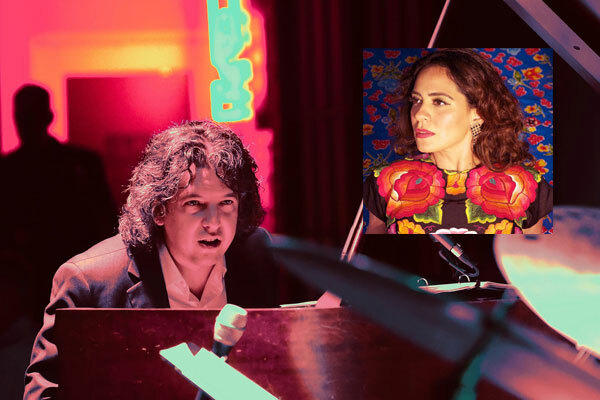 San Antonio artists who’ve previously received the grant include Ruth Buentello and Ana Fernandez, who both won the award in 2017, and Vincent Valdez in 2015. As reported by ARTnews, this year’s list of winners (25 total from across the country) is among the most diverse with 70 percent of the recipients identifying as female and approximately 80 percent as non-white. Currently, the artist is working on several pieces that will make their debut over the coming months in various exhibitions across the country including “Queer Craft” at the University of Minnesota and an upcoming performance at the McNay. Born along the U.S.-Mexico border in the city of El Paso, Villalobos is largely influenced by the merging of cultures and takes a particular interest in the use of language and its ever-evolving nature. His work explores gender norms, gay identity and the effects of an overbearing patriarchal society. He is a 2016 graduate of the University of Texas at San Antonio and currently a resident artist and co-director at Clamp Light Artist Studios and Gallery. Here’s a look back at some of Villalobos’ most memorable work of the last two years. In 2016, Villalobos was among five artists selected to receive the Artist Lab fellowship grant and participated in the Artist Lab exhibition at the Guadalupe Cultural Arts Center. For this show, Villalobos created a series of leather belts, each inscribed with a Spanish-language derogatory term meaning “gay,” on the area of the belt typically reserved for a family name. Among the belts was one that read Maricón. Another one read Jotito. Villalobos, who came out as gay in his early 20s, grew up hearing these slurs from both friends and family members. Hanging on the Guadalupe’s gallery wall, the series of belts appeared nondescript until closer inspection. Hiding from view, the underside of each belt was painted in pink. Titled De la Misma Piel (Of the Same Skin), the series references the artist’s sexuality while deconstructing a symbol of masculinity often found along the U.S.-Mexico border. The series draws attention to the pain one might feel when on the receiving end of these derogatory terms. On the popular website artofmanliness.com, a guide for choosing the perfect belt states, “Belts are worn for both function and style. A seemingly small accessory, they can have a surprisingly large impact on the impression you make.” For Mexican-American men who have adopted a Western aesthetic or Norteño style, the leather belt is often a symbol of pride, and its use is one way to assert masculinity. A key component of the Western-style belt is an oversized buckle. 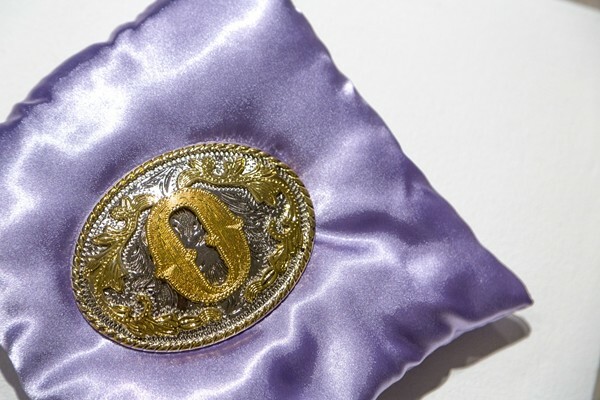 Along with this series, Villalobos presented a series of belt buckles, each consisting of a capital letter that makes up the word JOTO (meaning fag). De la Misma Piel marks the beginning of Villalobos’ explorations into men’s fashions and deconstructing of masculine symbols by repurposing Western attire. Here, the layers of fringe draped around the edges of the cowboy hats transformed these otherwise ordinary objects into an outrageous spectacle blurring the lines between what is considered feminine and what is considered masculine. For many men on both sides of the border, the sombrero has become tied to the idea of manhood. A tradition that spans cultures and stems hundreds of years back, it has been adapted by American men as part of a contemporary cowboy uniform and continues to be popularized by musicians and entertainers. After the Spanish arrived in Mexico in 1519, ranches were established and horses were imported from Spain. The native vaqueros were born (what we now call cowboys) and their traditions spread throughout Mexico and as far south as Argentina. 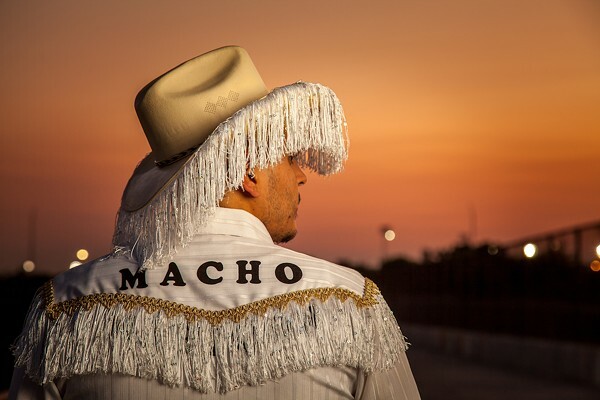 At the exhibition’s opening, which set an attendance record for the museum, Villalobos arrived dressed to the nines in a white cowboy outfit with the word “Macho” inscribed on the back. Just underneath that term was the word “Maricón” obscured by fringe. A Spanish term that also translates as “fag,” maricón might seem an odd choice to juxtapose against the term macho. But it was a bold statement and Villalobos’ decision to arrive in costume gave the installation a performance aspect as well. 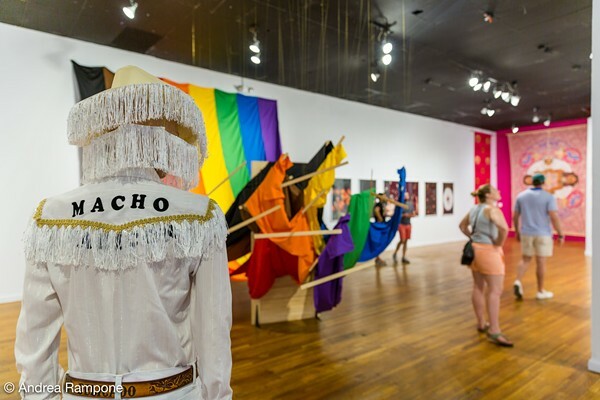 In the summer of 2018, Villalobos participated in “We Are,” the first exhibition of LGBT artists to be presented by the City of San Antonio. Bringing together both established and emerging artists, the exhibition marked a historic moment for the community at large. In his installation We Have Always Been, Villalobos presented an intricately bedazzled horse saddle alongside a pair of cowboy boots. Hanging in layers underneath the boots (which were also strung from the ceiling), were the boots’ detached soles with colorful pink and yellow flowers and a green mockingbird hiding in between. A label for the work read, “In We Have Always Been, Villalobos uses traditional masculine objects typically glorified by Latino men to challenge paternal-centered narratives by incorporating a materiality that softens the virility; an interstitial space where [machismo] is the delicate signifier.” The work’s title suggests gay men have existed since the beginning of time, despite being considered “in fashion” during the modern era. The title of the work also alludes to the fact that the Southwest, where cowboys roam free, had been occupied by Mexicans long before the U.S. annexed the area from Texas to California after the Mexican-American War (1846-1848), America’s first imperial war. In an era when Mexicans and Mexican Americans are often vilified and made to feel like foreigners in their own land, We Have Always Been is a gentle reminder of Mexican-American history. For all his efforts challenging power structures and patriarchal systems, Villalobos’ work remains unapologetically Mexican.